Kitchen and dining areas have become the hub of the home – a place to relax, grab a bite and enjoy time with family and friends. A variety of dining styles are available, all of which can be tailored to your own lifestyle and budget. A dazzling dining room starts with a striking set of chairs and a stunning table. Pairing contemporary materials such as chrome, brass, brushed steel, polished lacquer or aluminum with glass will result in a dining table that is a standout. Chairs can match the table perfectly or you can search for ones that complement it beautifully. By adding a coordinating curio, buffet, tea cart, or china cabinet you will have created a dining room that is certain to dazzle both family and friends. Does your home leave you challenged for dining space? Well, there’s no need to compromise on style because you’re short on space. Casual or “junior” dining room groups offer the same smart styling as their larger counterparts. If you can’t accommodate a junior dining room, consider a casual dinette set, a perfect choice for your kitchen or dining area. Country dining opens its arms to you and your visitors. In general, country dining tends to offer rustic textures. Wicker, rattan, pine and cast iron are all less formal than glossy wood or sleek glass. Weathered and distressed objects will be right at home in a country atmosphere. Consider easy-care fabrics and stay away from shiny textiles or dry-clean only. Coarse weaves also embody the casual style. You will feel right at home with denim, canvas and homespun cottons. A mixture of furnishings will relax your room. Uniformity is a trait of a formal style. Consider six vintage one-of-a-kind chairs with a similar shape and size. Or your chairs can all match, but the table could be different. Even one oddball chair at the end of the table as a focal point will make a casual decorating statement. Dress down formal chairs and tables with slipcovers in textured fabrics and floor-length cotton tablecloths. What Goes Where in the Dining Room? 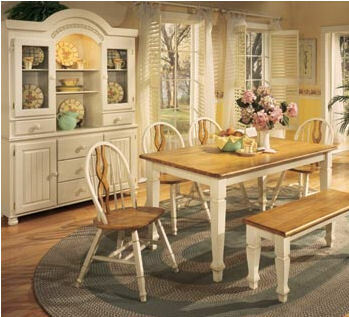 Choose your dining room table to fit your space. If your room is a long rectangle, a long table is a natural use of the space and won’t leave unnatural gaps on either end of the room. Tiny dining rooms will require a small table. A square table with a bench on one side might allow an extra guest to squeeze in. Sometimes a round table will allow for more place settings without bumping too many elbows. If you’re looking at a round table because of lack of space, look for one with a single pedestal in the center rather than legs. If you must have a large dining table in a small room, use decorating tricks to lighten the visual space. Try a glass-topped table and furniture with legs. Don’t forget the height of the room. If your dining room ceiling is too high, your guests may feel dwarfed and uncomfortable. Fill a tall room with bookshelves for height. A chair rail may also break up the expanse of wall, but should be avoided in a contemporary room. Hanging multiple prints on one wall can add personality and scale down a too-tall room. The shape of furniture can affect the look of the room. A round table will soften a room with harsh corners. A corner cabinet is both space-saving and creates a rounding effect. Elbow room for guests should be between 20 and 24 inches wide and at least 15 inches deep. The center of the table should have a strip about 12 inches wide for serving dishes and centerpieces. Use masking tape or pieces of newspaper to visualize the most appropriate size for your table, chairs, and an extra two feet behind for you to move around comfortably.